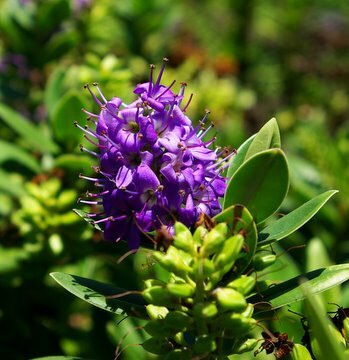 With one of the most interesting floras in the world, the islands of New Zealand lie 6,400 miles away, nearly across the Pacific Ocean and in the Southern Hemisphere, where they share many climactic features with California. The plants of New Zealand owe much of their uniqueness to the fact that New Zealand was once not an island but a fragment of Gondwana, a super-continent that embraced both Australia, Antarctica, parts of South America, and the Indian subcontinent. Then, approximately 80 million years ago, New Zealand became separated from the mainland and by sixty million years ago, became nearly as isolated as it is today. Extensive speciation has occurred since that isolation began, and it is estimated that an overwhelming 85% of New Zealand's seed plant species are native only there. 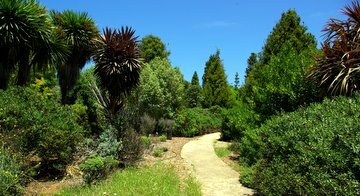 The Edward D. Landels New Zealand Garden was dedicated in 1984 in order to bring this unique flora to the attention of residents of the opposite hemisphere. Many unusual and fantastic plants await the visitor, their odd forms revealing much about the forces that shaped their evolution. Before humans arrived on New Zealand a millenium ago, large, flightless birds called moas ruled the land. It is believed that many of the plant adaptations you see in the garden (i.e., lack of bright flower color, thorns, leaflessness or very small leaves, zigzag or divaricating branches, a pronounced metamorphosis from juvenile to adult forms, and even "looking dead"!) are in response to the devastating beaks of these now-extinct browsers. Some New Zealand plants have become familiar to California gardeners and many special forms of these plants are on display. Among these are the the Lily Family members, the New Zealand flax, or phormiums, their striking colors reminding one of a New Zealand sunset. Pittosporum trees are frequently planted along the California coast for use as windbreaks. (The family name, Pittosporaceae, means "pitch seed" and refers to their sticky seeds.) 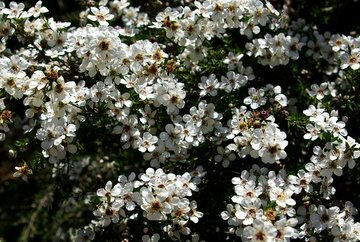 Though the manuka or tea tree (Leptospermum scoparium in the Myrtle Family) was formerly considered to be a weed in New Zealand, many beautiful hybrids now exist. They put on a spectacular display of crimson, pink, and white flowers in the late spring. Visitors to the New Zealand Garden also have the rare opportunity to see a kauri forest in its infancy, the tallest tree now being 18 feet tall. In time these trees can maintain immense proportions, eventually reaching 150 feet tall and with a trunk spread of 20 feet! The pamphlet "The Edward D. Landels New Zealand Garden" is available at Norrie's Gifts.